Dr David Brown from Warwick University came to talk to us about "Falling planets: how tidal interactions shape planetary systems". He studies exoplanets (planets outside our Solar System) by simulating their orbits and interactions on the computer and also by studying the data collected by various telescopes. Dr Brown commented that this was somewhat unusual for his field as most other exoplanetologists choose either to follow a practical career path or to study them in theory only. 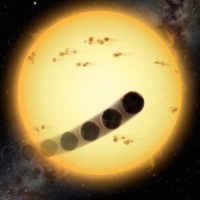 The very first discovery of an exoplanet was relatively recent, in 1992, by the radio astronomers Aleksander Wolszczan and Dale Frail who found two planets orbiting a pulsar with the unmemorable designation of PSR 1257+12. The term radio astronomers does not mean they worked on a radio station but that they studied radio waves collected by large radio telescopes. Also, a pulsar is a small highly magnetised rotating star that sends two beams of radiation into space from its poles which radio telescopes are able to pick up. A similar analogy would be a lighthouse shining its two beams of visible light across the sea. After only 20 years of study scientists like Dr Brown are beginning to understand some of the way that exoplanets can actually affect the star that they are orbiting around. In some cases the interaction of the central star and its planet can lead to the planet's orbit changing from an elliptical one to a circular one. This circular orbit is then thought to quite stable and the planet escapes the fate of other planets which may fall into the star and disintegrate.